It has been such a loooong time since I posted a new Clean & Simple Die Cutting episode. I do put it on my blog calendar every other week and do intend to write it, but other things just keep getting in the way. 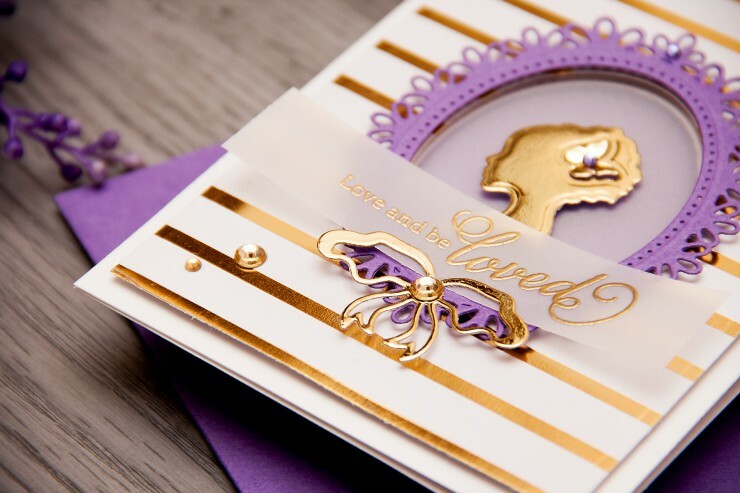 Anyhow, I’d like to share an elegant Love and be Loved Window Card using, you guessed it right, Spellbinders dies. I not only have a card, but also a video tutorial; it was filmed for Spellbinders Youtube Channel and has been posted there a few weeks ago so you might have already seen it. If not – feel free to watch below. This is a rather simple card, although I do consider every card of mine to be simple. 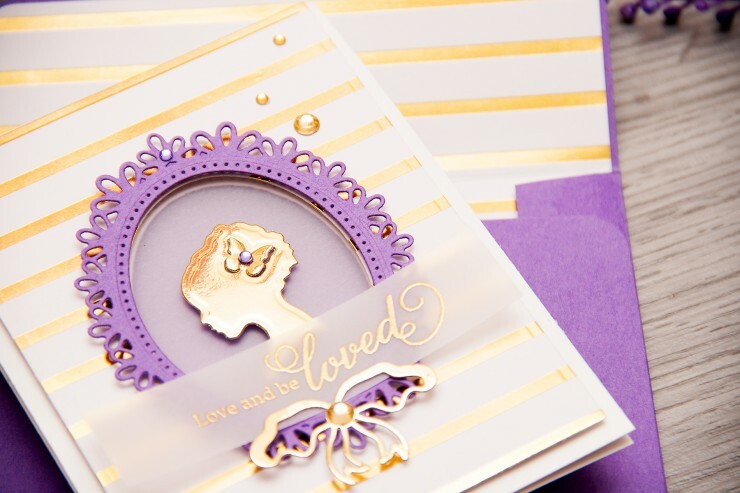 It features a die cut window with a vellum screen which houses a beautiful silhouette die cut. 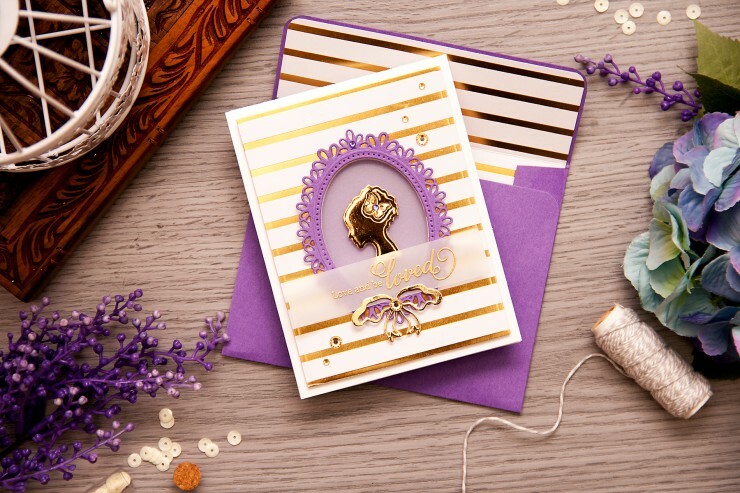 I chose to use golds and purples for this card and a bit of white. This happens to be one of my favorite color combinations and it works for just about any occasion, too. 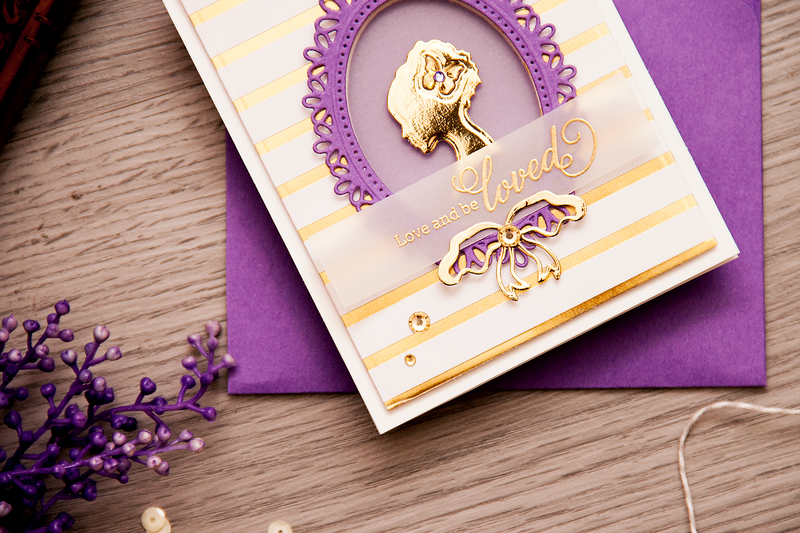 In fact, I recently made a few Christmas cads in gold and purple. I used stunning Oval Floral S6-028 dies for this card. I die cut a window and also a frame using this set. Its very elegant and feminine, too. I personally love the little pierced edge, I often use edges like this to add hand stitching to my die cuts. 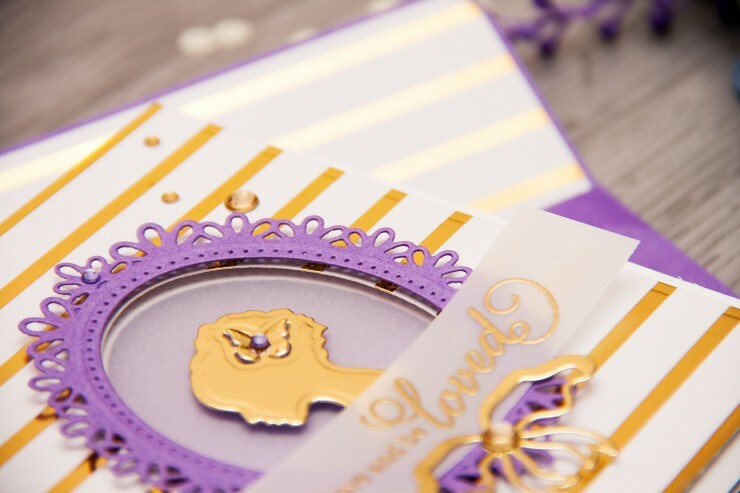 I had to use my favorite gold mirror cardstock. I simply cannot do without it. I also added a heat embossed sentiment in gold and adhered a few gold gems. I think they complimented my project quite nicely. Would you like to watch a video tutorial? You can watch it here, on Spellbinders Youtube channel or on my Youtube channel. Like it? Please give it a thumbs up and share with friends. Thank you so much!